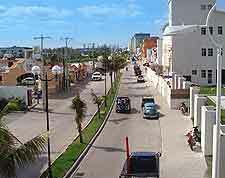 The island of Cozumel has two main interconnecting roads, which provide fast access to both the city and the airport. Cozumel International Airport (CZM) is located near to both of these roads and can be easily reached from all of the island's most popular resorts. The main hotel zone is situated less than 4 miles / 6 km away and contains a large choice of resort areas. Road traffic hold ups are rare on Cozumel and drivers invariably experience free-flowing traffic.